The word ‘masonry’ is often thrown around, but not always fully understand. A masonry structure includes anything built by fusing together materials with help from mortar. Mortar is a paste form of cement, when it dries it holds together a structure made of bricks, concrete, stone, marble, and other materials. Masonry materials can be man-made or naturally occurring. 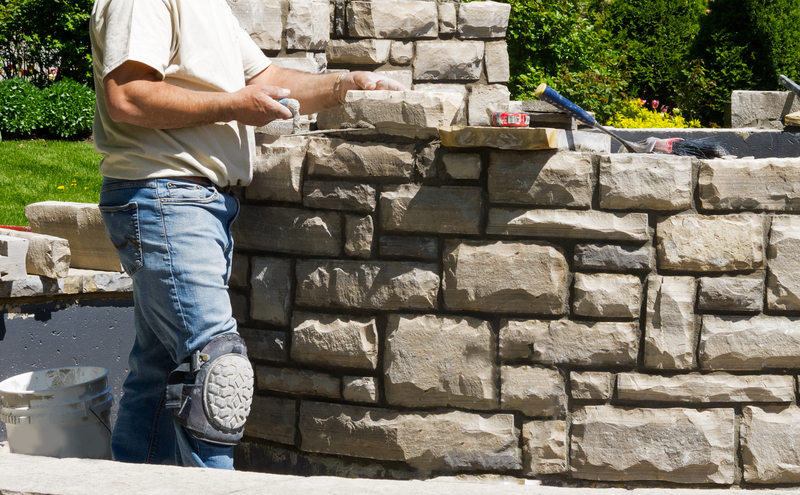 Knowing your options can help you make the best decision for your next masonry project. Here we explain different types of masonry work and provide answers about each one. In simplicity, there are two main types of masonry work, veneer and solid masonry. Veneer masonry is usually put to use for aesthetic purposes as opposed to creating a sturdy structure. This type of masonry includes pasting together materials to the outside of another structure, which provides the base for support. Solid masonry can hold itself up and fight off the elements; it is built free standing and is not attached to anything else. So long as a structure is put together using mortar and materials, it can be considered masonry work. Mortar plays a big role in masonry structures, working as the glue that holds everything together. Mortar comes in a variety of types, each one with a different level of strength. Types of mortar include M, S, N, and O. The highest strength mortar is Type M, while the lowest strength mortar is Type O.
Bricks are the most popularly recognized masonry materials, although many other resources can be used, such as stone and concrete blocks. Brick is the most popular form of masonry requested today. Bricks are known to be durable and good looking, lasting many generations and still remaining in style. Bricks also come in a wide variety, from more traditional blocks to modern textures and colors. Bricks often take on a serpentine masonry, which means that the lines included don’t follow a straight line; instead they take on a staggered pattern. Other types of masonry can also take on a serpentine style, which is known to add more strength to a structure. Bricks are typically made using clay, sand, water, and sometimes lime or ash. Different types of bricks can contain different ingredients that are mixed and then pressed together using some sort of steel mold. Once nicely shaped, bricks are placed into an ultra hot oven and baked into solid units. Due to the unique way that bricks are made, it can be difficult to match brickwork, in which case a professional is very useful. Two types of stones can be used to create stone masonry, either dressed or undressed. Dressed stone is going to come in more fluid sizes and patterns. Undressed stone, also known as rough stone, is laid as ‘rubble masonry,’ which provides a less clean look, and includes putting a wall together without a regular pattern. Instead, undressed stone provides a more authentic or natural appearance, which might sound messy, but actually offers great-looking result. Concrete is laid similarly to brick, with one cinderblock being pressed atop the other in a staggered formation. Since concrete blocks are much larger than bricks, it takes far less time to lay them. For this reason and more, concrete masonry units are very popular construction building materials. They tend to be more affordable and they are also fire resistance. Concrete masonry units come in a variety of sizes, shapes, and specialty forms making them a versatile building material. Schools, factories and residential buildings all often rely on concrete blocks as the bones of a masonry structure. Which Type Of Masonry Structure Is The Best? Masonry structures come in such a wide variety. They are built inside and outside, for walls, chimneys, and so many other elements of your home or corporate location. Some of the earliest homes known to date were made with masonry techniques, proving that quality masonry work can withstand the test of time. Bricks, stone and concrete masonry all provide a strong and attractive base able to survive long into the future, so which one is the best? The answer to this question largely depends on the project you have in mind. Depending on the style, needs, and location of your structure, different materials should be taken into consideration. Such as, if the structure is outside than durability and resistance to weather will be of utmost importance. On the other hand, if you are planning for indoor design elements, you are most concerned with the appearance of the final product, instead of how well it will hold up to the elements. Need help planning, building, restoring, or repairing a masonry structure of any type? We are here to help, contact the professionals at Turnbull Masonry today!